The small island of Nevis has one of the Caribbean's most important sea turtle protection programs thanks to its dedicated army of volunteers. While visiting Nevis recently, my nine-year-old daughter and I tracked endangered sea turtles in the moonlight on small isolated beaches along with volunteers from the Nevis Turtle Group (NTG). The Four Seasons Resort, the low-key luxury retreat where we stayed, helped connect us with the organization. Since 2006, NTG has worked with the Four Seasons Resort and the Sea Turtle Conservancy on a research project to study the migration patterns of the critically endangered Hawksbill turtle, along with the Leatherback and Green turtle, all of which nest along the Nevis coast. Nesting information along with information on the movement of the turtles is collected, turtles are tagged, and information on predators and poachers is also assembled. Additionally, every year the Four Seasons sponsors several transponders that help track sea turtles in the wild. Each summer the resort hosts a fun event called the Tour de Turtle, where hotel guests and volunteers line Pinney Beach to cheer their release of the tagged sea turtles. Turtles were once so plentiful in the waters around the Caymans that Christopher Columbus originally named the islands Las Tortugas. Over the years, the population has been depleted. In recent years, the Cayman Islands have put some real muscle into efforts to protect sea turtles. The Turtle Farm on Grand Cayman was originally founded back in 1968 on as way to raise turtles to sell commercially. 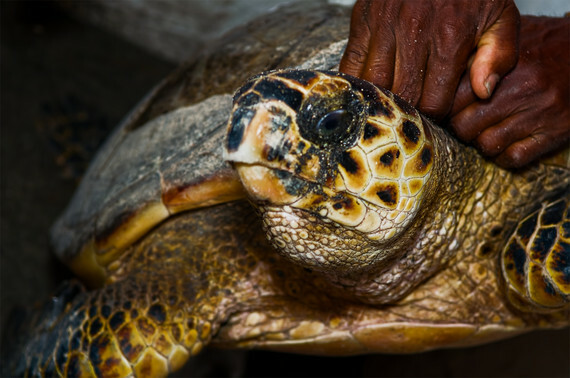 Over time, with the cooperation of the government, it evolved into a conservation project as well, serving as a sanctuary for endangered turtles. Today, visitors can help with the release of yearling turtles back into the sea, as well as swim with some of the biggest turtles in the world in the Turtle Lagoon. The ABC Islands -- Aruba, Bonaire and Curacao, along with their Dutch cousin islands -- St. Eustatius and St. Maarten, have put in place programs to help in the preservation of the sea turtle. For more than a decade, the Dutch Caribbean Nature Alliance has been tracking and monitoring population levels, habits, migration patterns and threats. The Turtugaruba Foundation on Aruba monitors sea turtle activity during the year, especially during the nesting season. Sea Turtle Conservation Bonaire conducts in-water surveys and has instituted tagging programs. During the nesting season beaches are patrolled to record nesting and hatching. Last year, a new monitoring program designed to assess the number of nesting and in-water sea turtles of Curacao was developed. The St. Eustatius National Parks Foundation monitors Green, Hawksbill and Leatherback turtles, primarily on Zeelandia Beach. And on St. Maarten, the Nature Foundation monitors sea turtle nests on beaches and the Sea Turtle Watch Group, a volunteer program, helps monitor beaches for nesting activity. Since 1999, turtles have been seeking refuge on a 301-acre beachfront oasis known as Jack & Isaac's Bay Preserve. Here, the sea turtles can nest and hatch without threat. Prior to this, about one-third of sea turtle nests on St. Croix were poached. A stringent sea turtle protection program was established, which has resulted in a sharp reduction is poaching incidents.